What a way to do it - a historic first win in 35 years against Manchester United saw Brighton & Hove Albion secure their Premier League safety. 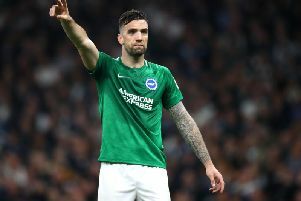 Albion's player of the season, arguably one of the best bargain buys of the summer, Pascal Gross got the only goal, but one that means the Seagulls have secured survival with two games to spare. It was a superb display from the hosts, similarly to the ones they have put in twice this season at Old Trafford with no reward, but this result makes up for that. The landmark goal eventually game in the 57th minute, but it seemed to take forever to be given. It was Gross' header that did it. And despite it being hooked away by Marcos Rojo, and play continuing, referee Craig Pawson soon signaled that goal-line technology had indicated it had cross the line. And they were deserved. A hard-working Albion, a creating Albion warranted nothing less than three points against an off-colour United, who had won all of the last four meetings between the two without conceding. While the visitors were poor, take nothing away from a hard-working Seagulls, who knew what was at stake. Anthony Knockaert had a superb game constantly running at the United back-four, while the home defence never looked like conceding. It could be said that with second place all-but assured and with one eye possibly on the FA Cup final against Chelsea, which is two weeks tomorrow, Jose Mourinho made six changes. Hosts Albion made just two changes from the side that drew 0-0 at Burnley last Saturday. Glenn Murray was brought in upfront at the expense of Leonardo Ulloa, while Davy Propper, having served his three-game ban, came straight back into the side for Beram Kayal. United's six changes from the team that drew 2-1 against Arsenal on Sunday saw Marcos Rojo, Matteo Darmian, Morouane Fellaini, Juan Mata, Anthony Martial and Marcus Rashford all included. They came into the starting XI at the expense of Antonio Valencia, Victor Lindelof, Ander Herrera, Jess Lingard, Alexis Sanchez and Romelua Lukaku (injured). The visitors had the ball in the back of the net after just three minutes, but fortunately for Albion, it was ruled out for offside. It came after Shane Duffy blocked off Rashford on the edge of the box and his resulting free-kick was touched in by an offside Fellaini. Dale Stephens' had Albion first effort after a good spell of pressure in the box. A couple of dangerous balls were only half cleared and eventually Stephens fired a low shot just wide. Knockaert then beat two defenders on a mazy run and slid in Jose Izquierdo on his favoured right foot, but his shot was blocked by a sprawling Chris Smalling. Murray had the best chance of the opening 20 minutes as he let fly with a dipping half volley from 25 yards, but a diving David De Gea was equal to it and tipped the ball around the post. Just before the half-hour mark, Izquierdo lined up another trademark effort from out wide, he connected, but De Gea pushed it over. From the resulting corner, Duffy's header flashed across goal and Murray was inches away from sliding it home. De Gea was on hand again five minutes later to save at the feet of Gross after Knockaert played him in on the angle to the right of the visitor's goal. Albion took the lead they had been threatening in the first half just before the hour mark as Gross' header was given by goal-line technology. Izquierdo managed to twist and turn in the box after a lucky bounce off the shin of a United defender. His cross was touched on by De Gea and while Gross' back-post header was hooked away by Rojo, referee Pawson signaled it had crossed the line. Soon after, and with the noise levels in the Amex sky high, Albion had penalty appeals waved away as Knockaert went down under the challenges of two United defenders. It was almost a second when Gross fired the ball back in after a corner and Izquierdo side-footed just the wrong side of the post from 15 yards. Mourinho made his changes and it did help a little. Maty Ryan was forced into a full-length save to his right to push away Rashford's sweetly-struck shot, then denying replacement Lingard. Hearts were in mouth with five minutes to play as Lingard burst forward, played a one-two with Rashford but side-footed wide from 15 yard. But Albion held. And the celebrations started. Albion: Ryan, Bong, Duffy, Dunk, Bruno, Izquierdo (March 88), Prppper, Stephens, Knockaert, Gross (Kayal 84), Murray (Ulloa 90­). Unused subs: Krul, Goldson, Schelotto, Locadia. United: De Gea, Darmian (Shaw 68), Smalling, Rojo (McTominay 76), Young, Fellaini (Lingard 68), Pogba, Matic, Mata, Rashford, Martial. Unused subs: Romero, Lindelof, Bailly, Lingard, Herrera, Shaw.